In recent times the issue of identity theft has become something that many people are talking about and many people are finding that they have been subject to. Of course identity theft does not necessarily mean that the individuals responsible will use your identity to commit crimes or fraudulently obtain other monies by deception. In some instances the theft of your identity is used for no other purpose than the theft of your own money. Skimming is the process by which identity thieves copy the details from your credit or debit card by using what looks to be the front of a bank machine. The front of the bank machine - ATM machine - is fitted with a false panel into which is fitted a small webcam or digital camera. Skimming works on the principle that anyone inserting a credit or debit card into an ATM (Automatic Teller Machine) can have their details scanned from the magnetic strip on the rear of the card in question. Built into this false front panel are a magnetic card reader - known as a skimmer - as well as a small webcam or digital camera which is used to take the still image or moving video of the card owner as they enter in their PIN (Personal Identification Number). It may sound like the stuff of television or movie fiction but it does happen and over the last five years the instances of skimming in the United Kingdom have increased quite dramatically. 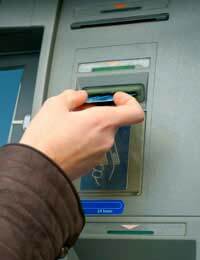 You should be aware that most ATM machines now - as a general rule - are already fitted with small cameras which point behind the person using the machine. The purpose for these cameras is to help identify anyone who may assault or rob an individual using the machine or to help identify anyone who may be using a credit or debit card in a fraudulent manner. The idea of a false front of an ATM machine may sound like the stuff of technical legend but it is true. The front of the machine can easily be falsified and it only takes a few minutes to install the relevant panels to the machine. The panel around the slot where cards are inserted is set to look as though it has been moved forward somewhat but this is to disguise the skimming machine which is placed behind it. Likewise above the area of the screen there may be a longer strip of paneling used to conceal a digital camera. As technology advances so technology gets smaller and the use of cameras is such now that the very smallest and cheapest of cameras still provide detailed imagery, enough for these so-called 'skimmers' to get the details of your PIN (Personal Identification Number). What Happens When My Details Have Been Captured? Once these 'skimmers' have gotten hold of your details they can be used in any number of ways. The first thing to remember is that the details on your credit or debit card will relate directly to your bank or building society account. These 'skimmers' normally operate in highly organised gangs and can be acting on behalf of larger criminal syndicates and of late there has been an upsurge in criminal gangs coming in from overseas to carry out such deception. Upon gaining your details these 'skimmers' can either use them to make withdrawals from your bank account at other locations or they can use the details of your debit and credit card to make purchases in retail outlets or over the Internet. Credit and debit cards can be copied for use by other individuals and it is important to ensure where possible your signature is as difficult to copy as possible. If you are in any doubt as to the safety of your credit or debit card details you should contact your bank or building society. If necessary they can issue you with new cards and cancel the old ones alternatively they can help you to open a new account and transfer all funds across quickly and safely. @JJ - you would have to ring HMRC directly in order to report it and to be issued with a new card. What about my NI number being stolen?How can I tell HMRC and get a new one?